We all know those super-fit people who fit in a jog at lunch, eat super-healthily, do a spin class after work and practise meditation at their desks. Great for them, but in reality, most of us find that our busy lives lead to us cutting exercise or calm me-time in favour of getting jobs done. However, we also all know we should be looking after our physical and mental wellbeing better, and not doing it leads to feeling worse (and guilty – which is terrible for our mental health). So, how do you motivate yourself? At a recent Progressive Travel Recruitment team chat, we decided to employ some help to get us into better habits. Our solution was to download a couple of team fitness Apps to try and improve our wellbeing at work. I wanted to look at options for both physical activity and mindfulness, as I know that everyone’s needs are different. After some research, I found two user-friendly Apps which offer a range of activities, as well as the option to connect with friends. The chosen two are MapMyFitness for active fitness and Headspace which leads you through 10 minutes of calm ‘headspace’ a day. MapMyFitness allows you to log your activity either while you’re doing it or after the event. By being connected to your friends, you can share what you’ve been doing. This is great for encouraging each another and also throws in a bit of healthy competition! Anyone who’s been a recruitment consultant will know what an engrossing job it is. It’s easy to get glued to your chair all day, barely stopping for lunch. And, as most of us work remotely in opposite corners of the country – and the world, we can’t just suggest a group walk. So, this App is a great way to encourage active breaks, but also bring the team together and share non-work-related successes. The beneficial side-effect is improved wellbeing at work. As for the Headspace App, that simply requires you to follow the programme which asks you to commit to a short period of ‘headspace’ – or simple meditation – a day. It’s a great way to take 10 minutes to yourself, slow down and recharge. Wellbeing at work can be most improved with a combination of physical activity and time spend on calming your mind, too. For those, like me, who love team activities, these Apps are a motivator and make exercise more fun. I like having the chance to enjoy these daily activities with my colleagues, despite them being all over the world. Our director Tony Macdonald has always walked his dogs before and after work. But he now uses the fitness App while he’s walking. He says, ‘It makes me competitive against myself, so I try to complete the same dog walk faster in the evening than I did so in the morning, so even that helps me burn more calories.’ Of course, calorie-burning isn’t the only motivation – but fitness, vitamin D intake, and general wellbeing are all improved. Overall, the Apps have been a great addition to our team. They’re useful new tools to encourage a healthier working day. 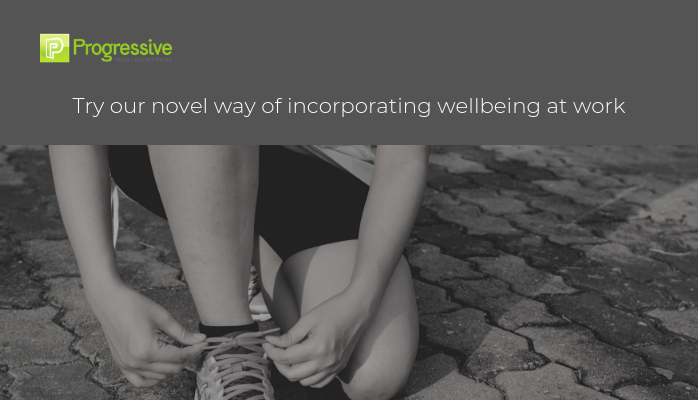 It’s also good to have company directors who fully recognise that wellness should be a priority in the workplace. Diversity and Inclusion in the Travel Industry – What’s the Score? Experience and a great CV vs a positive attitude. What’s more important?